This Christmas Southport is set to get a breath-taking LED conical Christmas Tree this festive season, funded by Southport Business Improvement District levy payers. The custom built tree will be a new and exciting experience for Southport and is capable of sophisticated light displays. Visitors will be able to witness over twenty thousand sequenced sparkling lights and will even be able walk inside the tree itself to witness the magical light shows! 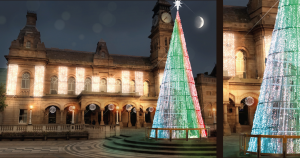 Taking three days to build, the stunning tree will sit in Town Hall Gardens. Work will begin on the installation early next week ahead of the BID’s big switch on event on Sunday the 18th. The switch on will be headlined by 90’s Superstars S Club, 911 and Livin’ Joy with a full afternoon of entertainment planned. CBeebies Cook & Line will be putting on a hilarious show in the afternoon and a huge programme of entertainment from 1pm onwards along with fairground rides, street entertainment and more. When the lights themselves go on at 5.30pm the audience will be stunned by a breath taking light display on the tree as fireworks explode from the roof of The Atkinson, all set to Christmas music. The festive fun doesn’t end there, from December the 7 to January 5, Town Hall Gardens will be transformed into and open air ice rink surrounded by a host of Christmas Chalets. Delivered by Sefton Council and Southport BID the Winter wonderland will allow families to skate underneath the spectacular tree to the sound of Christmas music. The BID is also funding two days of festive street entertainment on the 8th and 15th of December.